Did you know that in April of 1791, George Washington, first President of the United States, visited and slept in New Bern? In May of 1789 Washington decided that he would visit every state in the country. By the end of August 1790 he had been to all the northeastern states but delayed a trip to the southern states mainly because North Carolina had not yet ratified the U.S. Constitution. Once that occurred on 13 Nov. 1790, he began his plans for a Southern Tour to personally observe and meet the people of North Carolina, South Carolina, and Georgia and to determine the strength of the newly formed United States of America in those areas. Washington’s one hundred day journey of one thousand eight hundred and eighty seven miles through the South began March 21, 1791. He left in a white coach from the then United States capitol at Philadelphia and reached Halifax, North Carolina on April 16, 1791. On the morning of April 20, the President was greeted on the outskirts of New Bern by a group of leading citizens who escorted him into town. It is believed that he stayed at the home of the late John Wright Stanly whose home was quite elegant, though empty. Legend has it that New Bernians opened it up and cleaned it and furnished it for the President. The next day Washington walked around town and visited Christ Church, and the historic Cypress Tree at the end of Change Street. 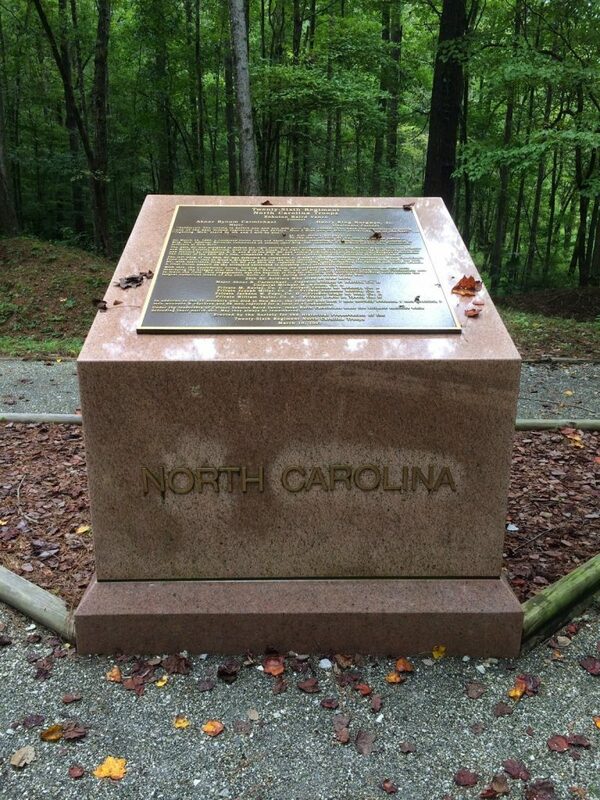 Washington had requested to see this spot under which Richard Dobbs Spaight, later Governor of North Carolina, had promised aid to Nathaniel Greene during the Revolution. Washington kept a diary during the Tour, and was “exceedingly” pleased with his reception in New Bern. The town received him with cannon fire, speeches, a grand dinner and a ball at Tryon Palace, and with great respect and admiration. That afternoon, Washington was feted at a public dinner and ball at Tryon Palace at which fifteen toasts were given. Washington left early as he was being honored at another ball at the home of Colonel Leech. The President, a lifelong Mason, received greetings from St. John’s Lodge No 2 and he responded to them on April 29, 1791. The communication was read to all the members and entered into the minutes of the Lodge. On February 22, 1799, five years after Washington’s visit, his birthday was celebrated at Frilick’s Hotel in New Bern. It was the first such public honor of his birth and New Bernians celebrated it every year in grand fashion. Washington’s Birthday, after the President’s death, became a national holiday. George Washington saw more of this country while in office than any other American president before the twentieth century. 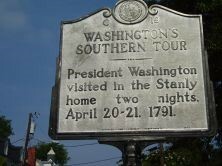 Hence the claim by many small towns and villages, “George Washington slept here.” But we know, in New Bern, he really did. The Battle of New Bern took place on March 14, 1862. Of the many stories of the brave Union and Confederate soldiers who fought that day, one of the most interesting is that of 21-year-old student Frazar Stearns. Stearns was a member of the Amherst College Class of 1863, where his father, William Stearns, was the college president. William wanted his son to become a minister, but Frazar wanted to be a scientist and was especially interested in chemistry. Frazar’s professor of chemistry, 35-year-old William Smith Clark, became an officer in the 21st Massachusetts Volunteer Infantry and encouraged many of his students to join. William Stearns initially denied approval for his son to enlist, but finally relented on the condition that Frazar join the 21st Massachusetts and remain close to Professor Clark. Lt. Col. Clark was in command of the regiment and 1st Lt. Stearns became his Adjutant. On March 9, 1862, Frazar wrote his mother: “we are going to-morrow morning at daylight somewhere, - where, exactly, I don’t know…always remember that any hour or any moment may bring you news that I am killed or dangerously wounded…These are horrible times, when every man’s hand is against his neighbor. But I have hope. Let the North pray more…” It was his last letter. moved towards the town of New Bern. On March 12, the 675 members of the 21st led their brigade and discovered abandoned fortifications. The 21st Regiment was directly in front of the brickyard where the Confederates had artillery pieces. Ordered to take the position, the 21st captured part of the brickyard but had to retreat. Clark then gave the order to “charge bayonets.” It was a bold move, and Clark received a promotion to Colonel because of it. But the 21st Massachusetts was soon forced out of the brickyard by a Confederate brigade. Clark then heard the news. Frazar Stearns had been shot through the chest and was dead, along with eighteen others. Clark was inconsolable, and General Burnside ordered that the cannon that had been captured by the 21st Massachusetts that day be given to the regiment. They voted to give the cannon to Amherst College in memory of Frazar Stearns. greatly affected by his loss. Stearns was eulogized, spoken of in state proclamations and honored with a large funeral. His father wrote a novel which included his beloved son’s letters and the eulogies given at his funeral. There was much shock and grief in the closely-knit town of Amherst, and while many others from the community died, the story of Frazar Stearns is still told and his memory honored. Ironically, the cannon that was donated in Frazar’s honor was on loan to the North Carolina Museum of History in Raleigh for several years. It was returned to Amherst in 2015 during the sesquicentennial of the Civil War’s End. What New Bern property was listed on the National Register for Historic Places in 1997 and took an Act of Congress to create? If you answered the New Bern National Cemetery at 1711 National Avenue, established on February 1, 1867, you are correct. Why was it established, who is buried there and where were soldiers buried prior to its creation? Before the Civil War, the US Government buried its soldiers near where they died. The number of casualties that occurred during the Civil War focused public attention on providing a decent burial for those who died in defense of the Union. On 17 July 1862, Congress passed the Omnibus Act, establishing the National Cemetery system and authorizing the President to purchase grounds “for soldiers who shall have died in the service of the country.” Fourteen cemeteries were established that year and used to bury the dead from hospitals located near large camps and battlegrounds. After the war, a vast search was conducted of battlefields, churchyards, farms, and other properties in order to locate Union dead who would be reinterred in these cemeteries. New Bern was occupied by Union troops from 1862-1865 and large camps of soldiers were situated in and around the city. After the Battle of New Bern in March, 1862, the dead were buried at local hospitals as well as at the Battlefield and Cedar Grove Cemetery. Bodies of Union soldiers were removed from the battleground as well as local cemeteries in New Bern, Beaufort, Newport, Kinston, and other places along the coast, and were reinterred in the National Cemetery. In 1868 the cemetery location was owned by Mr. and Mrs. William P Moore of New Bern who sold 7.6 acres of land to the US on March 13, 1869 for $570.17. On July 1, 1874 Isaac W. Hughes sold a narrow strip of adjoining land (.1 acre) to the US for the sum of $100, expanding the cemetery to 7.7 acres. William Dougherty, from the 101st Regiment, Pennsylvania volunteers was the first Superintendent of the cemetery. Graves were originally marked by wooden headboards but were later replaced with marble headstones. Graves were originally organized by states. There are 1051 “unknowns” buried in a separate section and there are 301 headstones marked “U.S.C.T.” designating members of the United States Colored Troops. Between 1898 and 1909, the states of Connecticut, New Jersey, Massachusetts, Rhode Island financed and erected special monuments at New Bern National Cemetery to commemorate the service of men from their states. By 1873 Congress extended the right of burial in a national cemetery to all honorably discharged Union Veterans of the Civil War. No Confederate dead were allowed burial there. Until the First World War, these cemeteries were often referred to as “Yankee Cemeteries” and ignored by most local residents who continued to memorialize their Confederate dead in local cemeteries. In New Bern, a special memorial was placed at Cedar Grove Cemetery to honor the many Confederate soldiers who are buried there. By the Spanish American War, burial was available to all who died on foreign soil by disinterring the body and shipping it home to a national cemetery. Eventually burial was offered to veterans of all wars. New Bern National Cemetery was closed to new internments in the early 1990’s. It was listed on the National Register for Historic Places in 1997. On January 1, 1867, a great celebration took place in New Bern. A tournament or “Ring” was held in which twenty-two knights, representing New Bern, Wilson and Kinston competed on a race track set up on the snow-covered banks of the Neuse River. Stands were erected for judges, the orator and the musicians, and wagons were provided on the outside of the track for spectators. At 11 am approximately 3,000 spectators, guests and participants left the Gaston House Hotel accompanied by the New Bern Comet Band and proceeded to the grounds just beyond the city. The Knights were led to the arena by the Chief Marshal, Colonel John D. Whitford, who wore a yellow silk sash with a red rosette on the shoulder. His aides wore red sashes with white rosettes. The Knights, splendidly arrayed with fancy uniforms and bearing such names as Knight of Newbern, Knight of the Rolling Neuse, and Knight of Craven, were led to the speaker of the day, Ex-Governor Zebulon Vance. An evening coronation followed at 10 pm. 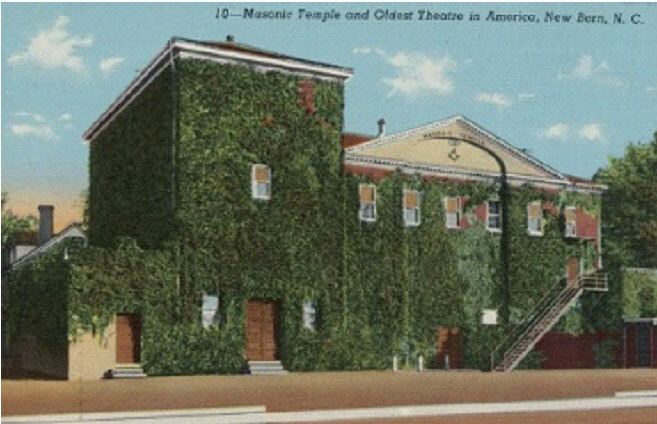 Over two hundred people attended the affair at Lowthrop Hall in the Masonic Hall Building on Hancock Street. The Knight of Newbern chose Miss Carrie McLachan of New Bern as the Queen of Love and Beauty. The three runners-up then chose their maids of honor. Zebulon Vance presented the trophy and crown. The Coronation Ball was deemed a success and continued until 2 am. How did all of this begin? The original Ring tournaments, relics of jousting, originated in Europe, spread from France to England and finally to the American Colonies. Participants usually dressed in colorful medieval garb and assumed titles. The winner was the knight who took the greatest number of rings. The consistent themes of these tournaments were honor and chivalry. The first reported tournament in North Carolina took place at Shocco Springs on September 15, 1857, prior to the Civil War. Participants and townspeople loved the pageantry and events began to spread throughout the state. No tournaments took place during the War years, but soon a schedule of tournaments began again. A tournament in Wilmington on Feb 1, 1866 drew a large crowd, and the 1867 New Year’s Day combined tournament was so successful, that New Bern staged their own tournament and ball two weeks later. In February of 1867, they also held a tournament for children described as “chivalry in pantelets.” By 1876 the townspeople in New Bern lost interest in the tournaments. They were more interested in who was chosen as the Queen of Love and her Court, rather than in the competition itself. One of New Bern’s finest artisans died during this month in 1834. Who was he and how did he leave his mark on our young town? During the 1700’s-1800’s, New Bern was a prosperous town filled with skilled craftsmen of all types. Of New Bern’s many silversmiths, one of the most prominent was Freeman Woods. A native of New Jersey, prior to his arrival in New Bern he worked in New York City, listed in the New York City directories from 1791-1794 at 11 Smith Street. 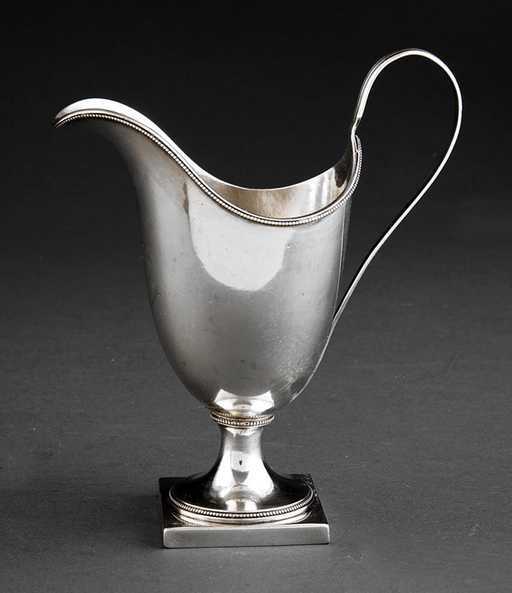 By December 27, 1794 Woods had established himself in New Bern as both a silversmith and goldsmith and advertised that he started a business in which one might purchase tankards, teapots, tablespoons, sugar tongs, etc. He was a skilled engraver and could create a piece with very short notice and in the latest style. His lines were simple with perfect proportion. In the Craven County Court minutes from 1800-1805, Christopher Masters and David Murdock were apprenticed under Freeman Woods to learn the silversmith trade. Both were sixteen years of age at the time. New Bern. Their youngest son, William Hollister Oliver (1829-1908) married Hannah Taylor Attmore (1829-1881) in 1854 and the couple lived in the Attmore-Oliver House in New Bern, now owned by and the current office of the New Bern Historical Society. If you check your silver and you see this mark, you have a beautiful piece made by Freeman Woods. A Freeman Woods creamer with the neoclassical helmet shape, strap handle, beaded trim and trumpet foot of the type owned by the New Bern Historical Society. After the Civil War, as part of a reconstruction plan, William H. Holden was appointed the provisional Governor of North Carolina by President Andrew Johnson. He was ordered to call for a state convention to restore North Carolina to the Union, and to provide for the election of a new governor, state legislators and US congressmen. The call for elections was necessary to reestablish civil government in the state. Other important mandates were included as well, such as the repeal of the 1861 Ordinance of Secession and ratification of the 13th Amendment. The convention was scheduled for October 2, 1865. Several African American ministers and property owners met in New Bern to discuss the idea of having a statewide convention for freedmen. There were concerns that no African American delegates were chosen to attend the constitutional convention and they wanted to make sure the needs of their population were considered. The Freedmen’s Convention then was scheduled to take place in Raleigh on September 29, 1865. James Walker Hood, an African Methodist Episcopal Minister was elected as the presiding officer. Hood was born in Pennsylvania but moved to New Bern in 1864 as a Church missionary and became prominent locally. He was the founder of St. Peter’s AME Zion Church. Craven County provided the largest number of delegates of the over 100 men from 34 counties who were chosen to attend the Freedmen’s Convention. The convention was an attempt by the leaders to push for full political rights for African Americans, including the rights to testify in court, vote and serve on a jury. In Hood’s acceptance speech, he called for voting rights for all African American males, but many of the delegates disagreed, including James H. Harris of Raleigh. Harris and Abraham Galloway, a prominent African American activist in New Bern during the war, decided on a compromise resolution which called for the protection and education of African Americans and the elimination of racial discrimination. The document also noted the importance of just labor compensation, education for African American children and reunification of families that were separated during the Civil War. Before the end of the Freedmen’s Convention, the delegates issued a written document to the Constitutional Convention which was to meet three days later. The document was acknowledged but no action was taken. 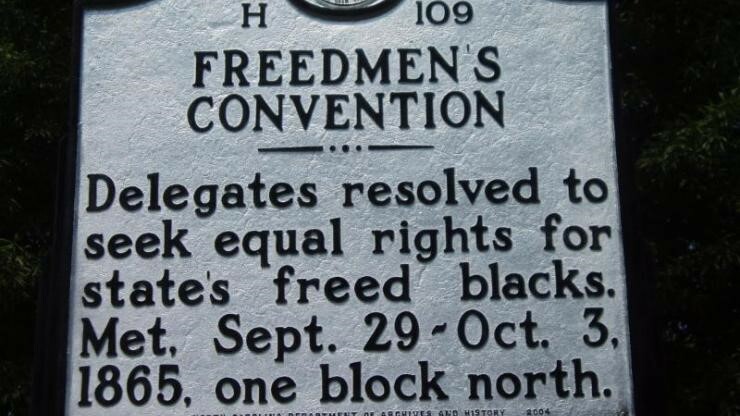 Before they adjourned, the Freedmen’s Convention voted to form the North Carolina State Equal Rights League and scheduled a second convention for the following year at the same time and place. Due to his moderation and leadership, James Harris was elected the first president. The Freedmen’s Convention of September 1865 was the first statewide assembly of African Americans in North Carolina and it all began in New Bern. Robert J. “Strawberry” Conderman was the first person in Craven County to be killed in WWII. He was born August 13, 1918, and upon graduating from New Bern High School, entered the University of North Carolina, receiving a bachelor’s degree in commerce and becoming an aviation cadet at Pensacola. Upon completion of flight training he was stationed in San Diego and then Hawaii, before being transferred to Wake Island. On December 8, 1941, (December 7, US time) the squad learned of the Japanese attack on Pearl Harbor. Japanese bombers soon flew over Wake Island in a surprise attack shortly before noon. As the alarm sounded, Conderman ran to his F4F-3 “Wildcat” Fighter plane but was cut down by strafing. Fellow Marines rushed to his aid, but Conderman pointed to other wounded Marines and said “Let me go. Take Care of them.” He died of his wounds just hours later at the age of 23. 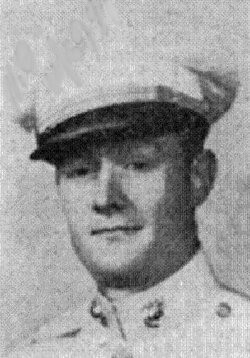 2nd Lieutenant Robert Conderman received the Purple Heart and is buried at the National Memorial Cemetery of the Pacific (also known as the Punchbowl) in Honolulu, Hawaii. His name is inscribed at the top of the WWII Memorial of Craven County located on the grounds of the old county courthouse, which honors the deaths of local soldiers. Robert’s father, Fred Conderman, was an assistant postmaster for New Bern, and he tried to enlist to avenge his only son’s death. His age kept him out of the Army and Navy, but Marine officers accepted him as a mail officer with the rank of captain. He joined the First Marine Division and participated in numerous assaults and campaigns in the Solomon Islands. He was only supposed to handle the mail, but he took his off-duty time to accompany as many aviators as possible. He contracted malaria and returned home, retiring from active service in 1946 with the rank of major and returning to his job as postal inspector. In 1944 he received the silver Eisenhower medal for his award as “Fighting Father of the Year.” Fred Conderman died at the age of 79 and is buried at the New Bern Memorial Cemetery. On July 1, 1863, the first day of the Battle of Gettysburg, the 26th NC infantry encountered the famed 24th Michigan, known as the “Iron Brigade.” The battle was long and bloody, but the 26th NC defeated their opponent on that day. While their courage will be forever remembered, the unit suffered unparalleled loss. Prior to Gettysburg, the 26th NC Regiment had their first foray into battle at New Bern during March, 1862. Most of the troops were from the middle and western part of the state and they were commanded by Zebulon Vance who later became the war time Governor of NC. While Confederate forces were defeated at New Bern, the 26th NC later distinguished itself in battle. Before arriving at Gettysburg, PA, the 26th NC had 843 soldiers, and was the largest regiment in Robert E. Lee’s Army. On the first day of the battle of Gettysburg, the 26th NC advanced at McPherson’s Ridge against the 24th Michigan. Their commander, Henry King Burgwyn Jr., age 21, known as the “boy colonel”, was shot through his lungs and killed while transferring the regimental colors. Another thirteen flag bearers were shot and one by one, every colonel, major, and captain was either killed or wounded. The only remaining officer, Colonel H.C. Albright, took command of the entire regiment. The fight between the 26th NC and 24th Michigan was the bloodiest engagement of the three day battle of Gettysburg. The 26th NC had 558 casualties out of 843 soldiers. Company E was left with twelve men, and Co F consisted of one color bearer. On July 3, the last day of battle, the regiment again fought, this time at Cemetery Ridge. Eight more color bearers were killed or wounded, including Sgt Robert Hudspeth of Co. F. Ninety-nine men were killed in total. Despite the odds, one color bearer and Sergeant carried the 26th NC colors to the top of the slope and stone wall. The Union troops of the 12th New Jersey, out of respect for their courage, held their fire and helped them over the wall where they surrendered. On this third day, the 26th NC had numbered about 230 men. That night, only three officers and 67 men were able to answer roll call. All twenty men who carried the colors, 81 out of 82 men in Co E and all 93 men in Company F were dead. The 26th NC lost the highest number in any regiment in a single battle during the Civil War. There are two monuments at Gettysburg in honor of the 26th NC. The monument at the Angle is the smallest, representing the tremendous loss of life from the regiment. The other, at Meredith Avenue, reflects the size of the unit after the first day battle. On March 10, 2007, the Society for the Historical Preservation of the 26th Regiment North Carolina Troops erected a monument at the New Bern Battlefield to honor the unit. It is the largest monument to the 26th NC, representing the unit at full strength. A man credited with revolutionizing naval warfare was born in this month in New Bern. Gabriel James Rains was born in June 1803, the eldest son of Ester Ambrose and Gabriel Manigault Rains, a cabinet maker. He and his younger brother, George Washington Rains, both attended New Bern Academy and West Point, and were said to be brilliant. They became experts in the use of land mines, torpedoes, and other explosives and were known in New Bern as the "the Bomb Brothers." Gabriel Rains graduated from the US Military Academy at West Point, New York in 1827, 13th in his class. He was commissioned as a 2nd lieutenant and fought in the Seminole Wars. It was in 1839 at Fort King, Florida that Rains first began to experiment with explosives. He was shot during an altercation with Indians and was so badly wounded that his death was announced in the paper. He recovered and was promoted to brevet major due to gallantry and meritorious conduct in the attack. Rains then served during the Mexican War as well as the Indian wars on the West Coast. At the outbreak of the Civil War Rains resigned his commission and on 31 July 1861 joined the Confederate Army. On 23 September 1861 he was appointed brigadier general from North Carolina and given command over a brigade near Richmond. Rains commanded at Yorktown during the winter of 1861–62 and continued his experiments with mines. He developed a type of subterranean mine called "torpedoes,” patterned after a design by Samuel Colt. The development of the first modern mechanically-fused high explosive anti-personnel land mines was attributed to Rains during the Battle of Yorktown in 1862. Rains also invented a machine for manufacturing gun caps. Rains was placed in command of the conscription and torpedo bureaus at Richmond in and while organizing a system of torpedoes and mines to protect the harbors, he began to devise plans for the torpedo defense of Confederate ports. President Jefferson Davis was impressed and directed Rains to put his plans into operation. Rains was sent to Vicksburg, Charleston, and Mobile. From then until the end of the war he bolstered the defenses of major Southern ports with torpedoes and mines. By the end of the Civil War, nearly 2,000 standard pattern "Rains mines" were deployed. Rains was formally appointed chief of a newly created Torpedo Bureau on 17 June 1864 and remained in this position until the close of the war. Under his supervision torpedo factories were established at Richmond and Wilmington. Although Confederate leaders early in the war objected to the use of mines on moral grounds, these devices were widely employed by the end of the conflict and were a great success. They provided an effective deterrent to Union naval attack, and they sank about fifty-eight Union vessels. After the war Rains lived for a time in Atlanta before moving to South Carolina, where he worked as a clerk from 1877 to 1880 in the Quartermaster's Department of the U.S. Army at Charleston. He died in Aiken, S.C. on August 6, 1881 and was buried at St. Thaddeus Cemetery.